Further advance of the road infrastructures management by extension functions utilizing GIS and 3D point cloud data. By utilizing GIS and 3D point cloud data by InfraDoctor's extension functions (ex. drawings creation, damage detection of pavement and wall type surfaces, traffic control design for work safety zone and 3D simulations) it is possible to develop advanced road maintenance management systems. It is possible to draw a plane plan or a cross section plan semi automatically by InfraDoctor with 3D point cloud data. The accuracy of the cross section plan thereby created is down to the last millimetre, and a developed plane plan is capable of being accurate for mapping requirements at a scale of 1:500 (depending on the GPS receiving status, a supplementary survey may require to compensate for the point cloud data). You can draw a 3D-CAD model semi automatically by InfraDoctor with 3D point cloud data. You also can draw a 3D FEM analysis model utilizing a 3D-CAD model which you made easily. Therefore, this function will be useful to manage CIM (Construction Information Management) data going forward. 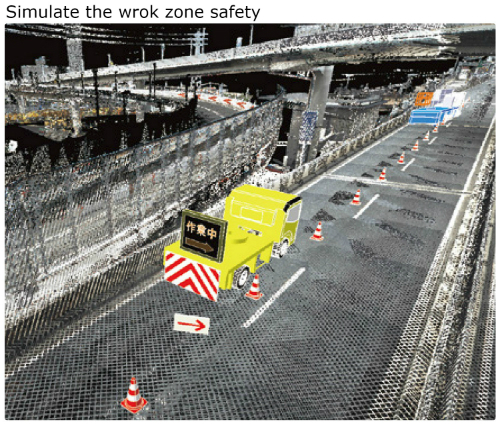 You can simulate working traffic flows by InfraDoctor mount into 3D point cloud data. This function makes efficient working at the site, because you can choose the working vehicle best suited to the task and check operations procedures and interference with obstacles. InfraDoctor can create a traffic control plan for safety work zone semi-automatically by joining 3D point cloud data and CAD data of traffic control devices. And you also can see driving simulation images with a driver�fs view in the safety work zone. This means you can make realistic and user friendly consultation documents. InfraDoctor can create a reference plane of pavements and structures utilizing 3D point cloud data, and can show the differences between the reference planes and 3D point cloud data in a tint gradient diagram. You can use this to early detect rutting, potholes in pavements or flaking and peeling damage in concrete by this function. This could be very useful for first stage inspections prior to making detailed inspections.